Last winter, my firewood man made a delivery when I wasn’t there. Later he remarked that no one was home but an “antique” dog. We now come to the last chapter of Teddy’s life. As he aged, his arthritis progressed. One winter I decided he should no longer live outdoors, so I gave him a bath and let him in the house. He instinctively knew life had changed for him. The dog who’d never tried to climb on furniture took one look at my favorite chair, scrambled in, and curled up. I didn’t mind, as long as he was clean. To protect my good furniture, I’d set a basket of crochet on the seat. He knew it was off limits, and obeyed. Later, when he became incontinent, I had to keep him off all the furniture. Eventually, he became unable to climb on it anyway and could barely make it up steps. In the meantime, with Teddy indoors at night, deer and rabbits ate my vegetables and wild hogs rooted up my garden beds. Living with Teddy was like sharing a house with a 90 year old man. He wouldn’t talk to me. He snored so loudly I could hear him through the walls and I swear he slept 23 hours a day. On nice days when he was outside, he’d crawl under the house and I could hear his snoring through the floor. He began to stink. I’d bathe him, he’d lick himself, and within hours he’d stink again. His incontinence grew worse, even with medication. I tried to diaper him but he developed diaper rash. Finally, I barricaded some rooms to keep him out and resolved to throw away the rugs in the others after he was gone. Despite all this, I loved him and (when I wasn’t mad at him) I enjoyed his companionship. His traveling days came to an end when he couldn’t climb in or out of the van. Once when I went on a trip, a friend kept Teddy. Afterwards he told me, “He kept chasing my chickens!” Now, Teddy had never chased anything besides wild animals (or any cat who challenged him) and by now he couldn’t get around well enough to chase anything. I asked my friend what he meant. He laughed and told me how Teddy would lie in the yard and occasionally raise his head, turn towards the chickens, and bark. The chickens paid him no mind. For three winters, I did not expect Teddy to make it another year. He was a tough old guy, but his mobility steadily decreased. He’d bark at the porch steps. When I told him barking wouldn’t make them go away, he’d glower at me. I knew he was in pain despite the medication I gave him twice a day. Then he started to poop in the house. He’d never done anything like that before. I knew it wasn’t accidental—he just didn’t want to tackle the porch steps. My fussing and cussing must have been less trouble to him than climbing steps. Finally, the time came. I called my vet. She had been treating Teddy for 16 years and was fond of him, but she agreed it was time. She prepped him and I stood beside the table with my arms around him when she gave him that final injection. I talked to Teddy, telling him how he would now be able to chase the rabbits and deer again, and it would no longer hurt. I felt him relax. I felt his gratitude and relief as the pain subsided. Don’t tell me dogs don’t have souls. The vet checked his heart and nodded. She was crying almost as much as I. Afterward, it was so strange to come home and no Teddy to greet me. Or walk around the house and not see him in his usual napping places. Then I dreamed of him. Nothing significant, only a dream that he was in the house with me, doing normal, everyday things. These dreams came three nights in a row. On the fourth night, no dream. I knew then he had finally passed on to the Happy Hunting Ground, where all good dogs go. When my daughter Amber lived at home, she took care of my animals when I traveled. Once she said Teddy missed me so much he wouldn’t eat when I was gone. It turned out she was feeding him twice as much as I did! He ate like a cat, nibbling his food throughout the day, not gulping it down all at once like some dogs. He’d leave what he didn’t eat. When Amber was not available, a neighbor tended my animals. One summer, I came home to find Teddy wearing a pink flea collar. No one knew where he got it. Of course, he managed to scratch it off and lose it. One day Teddy and I took a walk on the dirt road. A neighbor I didn’t know well said, “Hello, Teddy.” I stopped to inquire how he knew Teddy and learned that while I was traveling, instead of staying home to keep the varmints out of the yard, my faithful dog was nearly living at their house! That’s where he got the flea collar. He seemed to understand that the van was our home away from home. If a park ranger stopped by our campsite, Teddy would bark until I told him it was ok. One year we went to Arkansas. From there my mother and I flew to Washington to visit my sister Sue. I left Teddy and my van at Mom’s house, under the care of my nephew. Teddy made himself at home and didn’t leave the farm as long as my van was there. But things were different in the city. 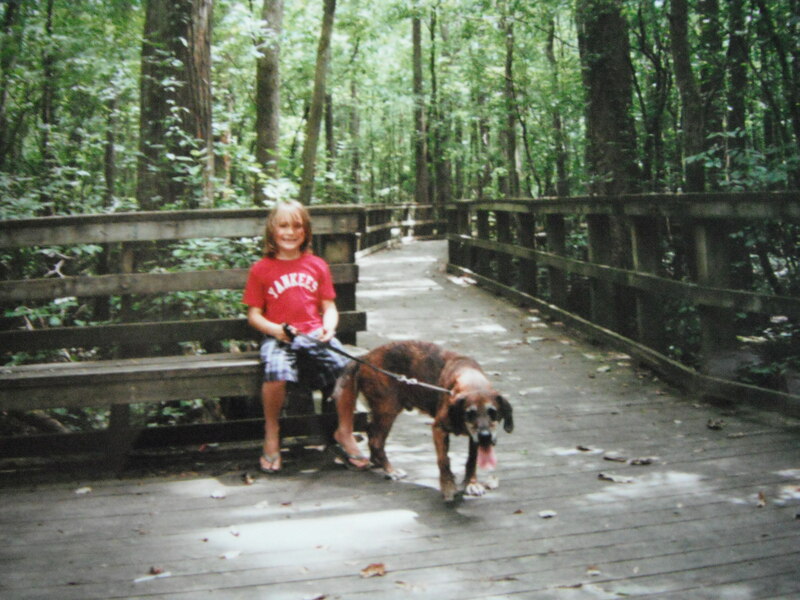 One summer when we visited Amber in Virginia Beach, I tied Teddy in the back yard at night and slept in the house. The next morning he was gone. I hiked all over the neighborhood but no one had seen him. We called the pound but he wasn’t there. I was afraid I’d lost him forever. That afternoon, Amber’s father-in-law returned home and said, “Get your damn dog out of my car.” He’d found Teddy! On a whim, he’d decided to take a different route home, spotted an Animal Control truck, and Teddy being led toward it. Randy convinced the officer he knew whose dog it was, and Teddy was released without bail. Apparently, Teddy had gone as far as a house on a lake and hung out in the backyard all day. When the owners got home from work, they called the pound. After this, I slept out in the hot van with Teddy so he wouldn’t escape again. Teddy got along with most dogs but my sister Bonnie’s dog is jealously territorial. He wouldn’t let Teddy out of my van. Brutus sees me only once or twice a year but always greets me with wagging tail, even if no one’s home. He doesn’t even object when I use their hidden key to get into the house. Some watchdog! Bonnie said he senses I belong there. But Teddy was not welcome. Brutus had to be distracted so Teddy could get out to relieve himself. Then Brutus got curious about my van and wanted to check it out, but that was Teddy’s territory. He wouldn’t let Brutus near. As he aged, Teddy had trouble climbing into the van. He could get his front paws in, but I’d have to pick up his hind quarters and shove. Sadly, his traveling days were over. I always felt safe when he was with me, and I missed his company when he wasn’t. Next time I’ll tell you how Teddy became known as my Million Dollar Dog. 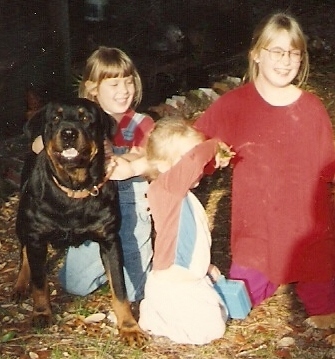 In the spring of 1999, Amber and my niece Arianne found a puppy on the side of the road. They brought him in the house wrapped in a towel and all I could see was a friendly little brown head. Then she took the towel off—there was not a hair on the rest of his body. He was covered with mange. The girls promised to find a home for him. They named him Teddy and took him to the vet. 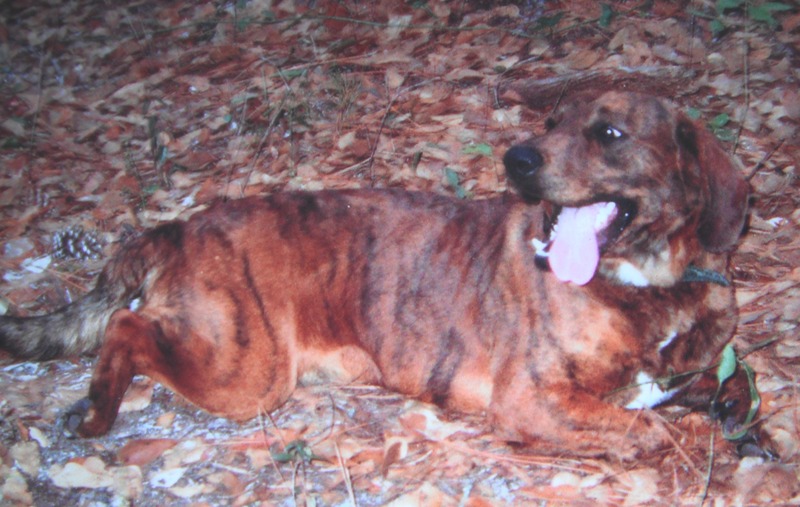 He responded well to treatment and before long, he was covered with a beautiful brindle coat. But before they found another home, I had grown attached. Teddy was a big a name for such a little puppy, so I called him Pup, and later Pup Dog. For the remainder of his life, he was known to the rest of the world as Teddy, but to me he was Pup Dog. If I called him Teddy, he knew I was mad at him. At first I kept him on the front porch and cleaned up behind him, but I didn’t mind. What I did mind was when he ate the potted plants on the porch. If they were in plastic pots, he ate the pots, too. He even ate a bag of potting soil! I’d never seen a dog go through a worse puppy-chewing stage. Of course he’d also eat any shoes or other objects within reach. I don’t think he ate anyone’s homework, but he did eat my beeper. One night when I was on-call, coming home late and tired, I must have dropped it in the driveway. I found it the next day, too badly chewed to function. I had a good excuse for work—my dog ate my beeper! He never got sick, so the diet must have agreed with him. In fact, he thrived. He grew to full size within a year. I could not keep a collar on him. I bought a nice collar with his name on it, only to find its mangled remains in the bushes months later. Afterwards, I kept his dog tags with his vet records. Teddy was an outside dog most of his life. He did a good job keeping varmints out of the yard. He’d sleep all day and patrol at night. I could hear him on one side of the house, then another, barking a brief warning to any intruders that infringed on his turf. His barking was never a problem. If someone drove into the yard, he’d bark once to let me know they were there. I never had any unfriendly visitors, but if I did, I believe Teddy would have kept them at bay. Some people have problems with deer or rabbits eating their gardens. I never had such a problem when Teddy was in his prime. He also kept coyotes away. The only creatures he cowed to were wild hogs. A herd of them lived in the woods behind me and would come to my yard to eat acorns and earthworms. Teddy knew they were bigger and meaner, so he stayed out of their way. The only time he stood up to them was to protect Amber. One evening, she walked to the neighbor’s and when she came home, the hogs were in the yard. Teddy drove them off. Then there was the cottonmouth. For a day or two, Teddy had fits, barking frantically at something in the yard. When we discovered the cottonmouth, Amber decided to kill it with a hoe. Unfortunately, I didn’t think to bring Teddy inside out of harm’s way. Amber chopped at the snake with the hoe and missed. She squealed and jumped back. Teddy thought the snake bit her. He immediately went after the snake, and the snake bit him. I took the hoe and finished off the cottonmouth, then took Teddy to the vet. Dogs often survive such snakebites because the snake is frightened and doesn’t always inject a full dose of venom, but I took no chances. What else could I do when the dog was willing to lay down his life for my child’s? Teddy was good company. He’d follow me around the yard. He was so curious he’d get between me and whatever I was doing, which could be aggravating. When I went for walks, he always accompanied me. That is, until a rabbit or deer crossed his path. Then off he’d go, paying me no mind. Hours later, he’d trot home. I never worried about him getting lost. Sometimes he’d go off on his own excursions and bring home a dead animal. Farmers disposed of dead livestock in the woods. Teddy would find them and drag home part of a cow or some other unidentifiable beast. Cow skulls and bones littered my yard, and of course, Teddy would smell just as bad as the rotting carcasses. Next week I will write about my travels with Teddy. We’re three dogs. Ruff, ruff, ruff. After this, they would exit on all fours, keeping in step. Speckles was white with black spots and Blackie was, of course, a white dog. I finished college, moved on with life, and became a mere visitor to the homestead. Whenever I arrived, my family’s dogs never greeted me with hostility. They might bark to let everyone else know someone was there, but they seemed to sense that I was not an intruder, that I somehow belonged. Duke was Dad’s special dog, his companion. Duke was a black Labrador, very intelligent and talented. He could climb trees–can you imagine a large black dog halfway up a live oak tree? Although Dad was not a biker, he had a motorcycle that he’d ride around for fun and into the woods to check his beehives. Duke would ride behind him on the bike. Somehow, he could balance and hold on. That was a sight to see. 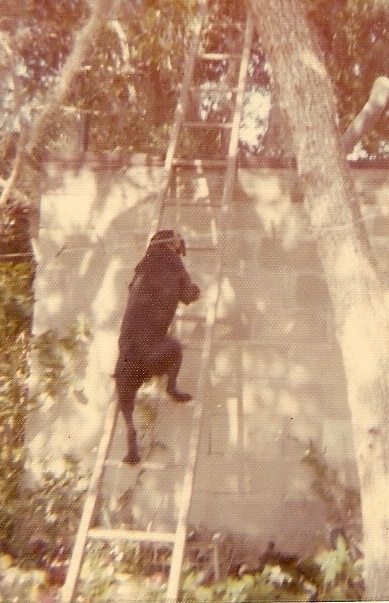 I couldn’t find a picture of Duke on the motorcycle or in the tree, but here he is climbing a ladder. He could climb down, too. Dad’s last dog was a Rottweiler named Bee Bear. Actually she was half Lab, but she looked full Rottweiler. My only previous experience with a Rottweiler was brief and unpleasant. One day as I returned to my car in a parking lot and started to open the door, I heard a vicious snarling that made me recoil with alarm. A Rottweiler sat in the passenger seat of the car beside me. He was probably only protecting his owner’s property, but if not restrained by that closed door, I think he would have attacked me. Upon reflection, I sure the poor dog had been mistreated because his reaction to me was brutal, not a mere territorial barking. On the contrary, Bee Bear was a sweet, gentle dog. Only her appearance was fierce. I was never afraid of her. Dad took Bee Bear everywhere with him. She rode on the back of his truck on trips to Arkansas and other places. No one would bother his truck as long as Bee Bear sat there! Dad was not a cat person. He’d tell Bee Bear that a cat was a bear, and she would chase the cat, but I don’t think she ever harmed one. I remember when Bee Bear passed away. She was quite an old dog. It was Dad’s 80th birthday. Every one of his children surprised him by showing up at the farm in Arkansas. Even my sister Lorraine flew in from Djibouti. But Bee Bear was dying that day. Sadly, she died on his birthday, but at least he had family around. We buried Bee Bear in the back yard and my bother Ed, who is a preacher, gave a brief service over her grave. Surrounded by all his children, I think Dad had a good day despite his grief. The last dog my parents owned was Valerie, a tiny part-hound who was terrified of thunderstorms. She would whimper and hide under the desk, and no one could comfort her. After my father died, Valerie was caught harassing the neighbor’s livestock, and she had to go. My mother is not a dog person. Next week I will write about dogs I owned in my adult life. This summer, after sixteen years of companionship, I laid my good dog Teddy to rest. In saying goodbye, I thought back to other dogs I’ve known through the years. When I was a child and we lived with Grandma and Grandpa Rogers, two dogs lived in the house with us, Grandma’s beagle Tinker and Aunt Hazel’s cocker spaniel Curly. In my memory they were big dogs, but at the time I was small. Curly had curly black hair. Tinker’s dog tags would tinkle whenever he moved, so I always associated his name with the sound. I remember them scurrying through the house, always together, it seemed, often underfoot. Grandma would call them to go out, or come in, “Curly and Tinker!” or “Tinker and Curly!” as though they were a single entity. I recall one other dog on the farm, a German shepherd named Lady, who was kept chained up in the cellar. I felt sorry for her. We didn’t play with her like we did Tinker and Curly, but I don’t remember her being anything but docile. German shepherds were popular at the time and for awhile Grandma raised them. Lady had a litter of pups but we didn’t keep any. Mom said she disliked the breed because one of Grandma’s was mean and attacked her. Grandma probably kept Lady chained out of caution for her grandchildren. I developed a dislike for German shepherds when I was older and we lived across the road from my grandparents. Our next door neighbor had a mean one he kept in a pen. Sometimes the dog would get out and come over to our yard. We were scared of him and would run inside if he got loose. Once when Mom was hanging out clothes, he chased her into the house. I never understood why my father didn’t shoot that dog. Grandpa Masters had a hunting dog named Skeeter. He was a nice dog but had to be kept tied so he wouldn’t chase game out of season. His leash was attached to a clothesline so he could run back and forth. He lived in a cozy doghouse summer and winter. My first dog was a small hound I named Poochie. I don’t remember where I got her, but I loved her very much. Unfortunately, she learned the bad habit of chasing cars from other dogs in the neighborhood. One day she chased the school bus. She ran into the wheel and died instantly. The bus driver was distressed, but it wasn’t his fault. I was inconsolable. Dad handled my grief by grumbling that I wouldn’t cry so much for him if he died. How unfair—I was thirteen and had probably told Dad many times that I hated him, but he knew better. I buried Poochie in my flower garden “with her tail to the North and her head to the South” as I wrote in a poem about her. After this, I tried not to let myself get so attached to a dog. Before we moved to Florida, we had a nice little Scotch collie named Topsy. Since we couldn’t take her with us, we left her with Grandma and Grandpa Rogers. They grew to like her and kept her the rest of her life. Next week I will write about dogs I knew in Florida, including Dad’s He had one who climbed trees and rode behind him on his motorcycle.